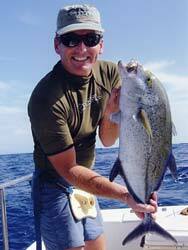 Reef Fishing - Nearly the entire south shore of our beautiful island is fringed by the longest barrier reef in Hawaii. It's a calm place for small fish to grow up and a great place for the hunters, like our famous Ulua, Kaku and Lai to come looking for a meal. 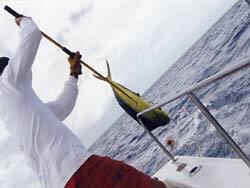 We whip with plugs and other artificial lures along the outer edges of the reef for fish that range from 5 to 100 pounds. On medium or light tackle they all put excitement into every hook up. Bring your favorite rod and reel for this activity and expect to break a lot of line! 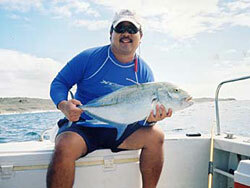 'Omilu - Bluefin Trevally. Typically 3 to 5 pounds, these Ulua are recognized by blue spots on their body and sweeping, neon blue pectoral fins. Ulua aukea - Giant Trevally. 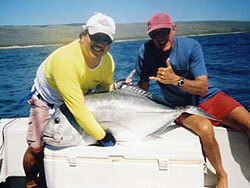 Record size in Hawaii is 191 pounds, but typical sizes range from 30 to 120 pounds. Other Ulua - There are several move species of Ulua to be caught on the reef, including Black, White, Yellow and Threadfin Ulua. Sizes range up to 50 pounds. Kaku - Great Barracuda. High speed fighter ranging from 10 to 50 pounds. Lai - Also known as Leatherback the Lai seldom exceeds a few pounds in size, but provides fishing excitement as it jumps repeatedly when hooked.